PARIS: The story of Eva Gabrielsson, the late Stieg Larsson’s partner of 23 years is well known: following Larsson’s sudden and tragic death just before publication of the first Millennium book, Gabrielsson was stripped of her rights to the Millennium books and any of the estate because of Swedish inheritance law. (Larsson had worked tirelessly against racism and right wing extremists and had received death threats. He did not marry Gabrielsson in order to protect her.) Her fight to reclaim, above all, the copyright, has been widely publicized. Stieg Larsson’s life partner Eva Gabrielsson wrote her autobiography in Swedish, worked with her French co-writer in English, and had the book translated into Norwegian — all this to protect the manuscript from falling into the wrong hands at home. 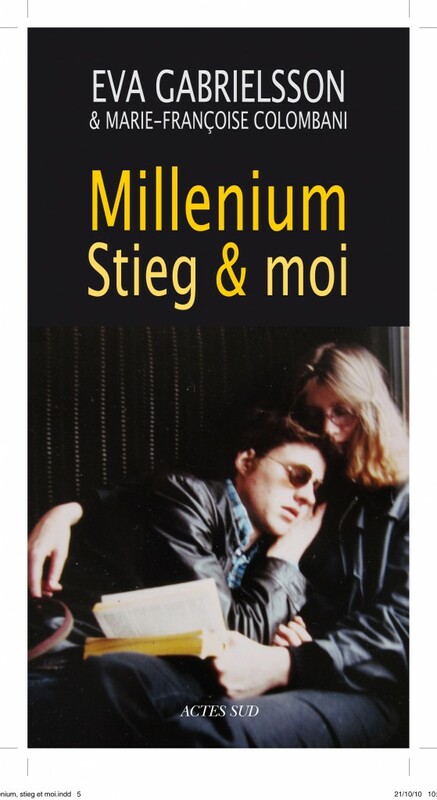 Now, in a book Millenium Stieg et moi that was published last month simultaneously in France, Sweden and Norway, Gabrielsson recounts the very particular world in which she and Stieg Larsson lived. The publisher holding world rights is the Arles-based Actes Sud, also the publisher of the French editions of the Millennium trilogy. Why did Gabrielsson, who doesn’t speak French, decide to publish her memoirs in French with a French publisher? “The Millennium books were synonymous with misfortune for Eva, she didn’t want to talk about them and didn’t even read them when they came out,” said Colombani. The original manuscript was in Swedish. Gabrielsson and Colombani communicated in English. Colombani would write in French, then, what she wrote would be translated into Norwegian. Gabrielsson wanted to avoid having a version of the manuscript in Swedish in case it fell into the wrong hands. Mutual friends and an editor at Actes Sud spoke and wrote Norwegian, which Gabrielsson was comfortable in. She would add to the manuscript, which would be translated back into French. “It was a lovely expression of Europe,” commented Colombani. For the journalist, who is originally Corsican, entering into Gabrielsson and Larsson’s rather austere world was eye opening. “There’s the cliché of Sweden, of a place where people are blond and well paid and in good health. Theirs was a somber, productive milieu. Millennium is now the biggest export from Sweden, and it’s the first time the world sees this side of Sweden — the extremist right wing and a neo-Nazi presence,” said Colombani. The book not only gives insight on the particular atmosphere in the Millennium books but mostly on the politically engaged lives that Gabrielsson and Larsson led, on their childhoods, bathed in working class values but with a hefty dose of religion. “For Stieg and me, we weren’t only familiar with the New Testament and with Jesus who asks one to turn the other cheek; what nourished us was the Old Testament, harsh and violent,” writes Gabrielsson. Gabrielsson’s book is a far cry from a tearful “tell all” and a more commercial publisher would have turned it down. Instead she recounts how she and Larsson lived, as far from the Millennium “industry” as one can imagine. The final chapter of the book is entitled “the fourth volume”, and sheds light on the rumored fourth Millennium book. Larsson had written over 200 pages of it, and it is probably in the computer that his former magazine has kept in a safe. Gabrielsson has read it, and suggests she could finish it, but as things stand now, she doesn’t have the legal right to. DISCUSS: Should Eva Gabriellson or Another Famous Writer Continue the Millennium Series?